Halloween is coming up shortly-- in fact, this Friday! To get the SPC faithful and myself into the spirit, I'm covering a game with an intriguing title, The Legend of Dark Witch. It's an inexpensive Mega Man-like game for the Nintendo 3DS eShop. Is this legend one worth telling? It would be a problem if Capcom was still making Mega Man games if there a massive number of Mega Man-style clones entering the market. As the publisher is not green-lighting any projects starring the Blue Bomber, then I say open the floodgates for Mega Man-inspired, styled, heck, even blatant clone games! Circle Entertainment's The Legend of Dark Witch is pretty much all three of these, albeit with a female cast of characters including the hero. What it all adds up to is an affordable adventure worthy of your time and money. 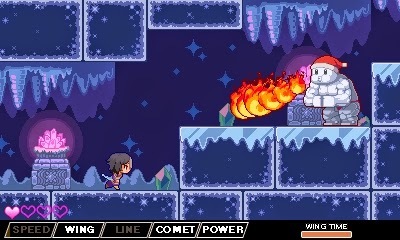 The Legend of Dark Witch throws you into the role of Zizou Olympia, a sassy goddess who begins a quest to recover a mystical power which has been stolen. The world just so happens to depend on this power for a myriad of tasks, such as making fire, all needed for its denizens' survival. Zizou is powered up and on the loose! Thus, in typical Mega Man-style fashion, this quest is completed through completing a series of stages chosen in any order you desire. 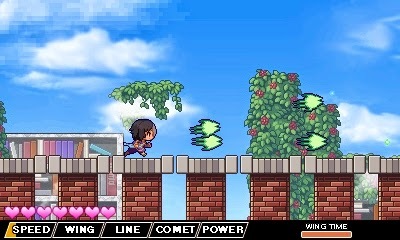 There are six starting levels, each containing a fairly straightforward path to the boss, one of many female challengers that Zizou must take on since diplomacy tends to fail. Upon defeating the boss of a level, you earn that warrior's special weapon. These encounters tend to rely on picking up on boss patterns, memorization of said patterns and boss tells to dodge attacks, and chipping away at their health gauge. This couldn't be more like Mega Man unless Zizou was originally a helper robot named Rock created by someone named Dr. Light. How cute. You want to face a goddess. Thankfully, the developers of The Legend of Dark Witch went one step further and crafted an enjoyable currency and powering up system to make their game more than just a Mega Man clone. All to Zizou's lonesome, her abilities aren't very impressive, especially for a goddess. However, defeated enemies drop fragments known as Tres that automatically get added to your overall total. In levels they temporarily strengthen your abilities, allowing for faster speed of Zizou, more range, and more shots being fired out in more directions. 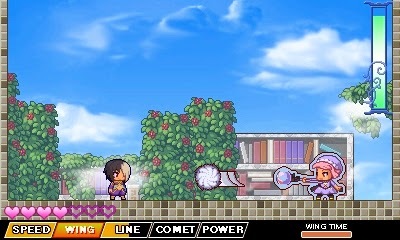 You can hold the fire button and run through levels, blowing most foes away with a single hit. Nonetheless, these bonuses remain with you in a level until you die. Outside of levels, Tres is used as currency to purchase permanent upgrades. From more starting health and lives to powering up special weapons to increase their usefulness, Tres offers the ability to make The Legend of Dark Witch an easier time for those that desire it. It certainly makes the harder difficulties and levels less intimidating. It's also important to note that even if you fail a level, you're able to keep the Tres you collected. This means you can continue whittling away at a level until you get strong enough to finally beat it if your skills aren't at a high enough level. 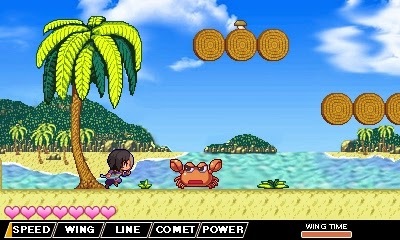 As for levels, each can typically be finished within five minutes, but also each contains speed-running capabilities. After all, each level records your best time, and it's always fun to share best times with Miiverse. Some levels have branching paths that lead to interesting discoveries such as hidden Pure Syega crystals, optional doodads that expand your abilities. Other times secondary paths are just there as an alternative way to the main route. Each level begins within a netherworld of sorts, a blue background area that materializes into the actual locale once a specific dimensional line has been crossed. There's some neat ideas in the level design to keep levels distinguishable from one another outside of aesthetics. For instance, one level has you riding up and down a path of arrows, allowing you to reach higher platforms, while another has you hitting a switch to make blue blocks solid while making red blocks transparent (and vice versa). the sunscreen and forget my mittens. Mega Man-style games generally don't take too long to complete, and that is very much the case with The Legend of Dark Witch, too. While the game can be beaten in less than an hour, achievements can be unlocked for performing in-game feats, such as beating the game in under 45 minutes, beating the game without buying any upgrades, and so forth. You can purchase bonuses within a special main menu shop which offers info on bosses, enemies, a harder difficulty mode, a musical player, a monochrome graphics filter, and much more. Each play-through of The Legend of Dark Witch can have you on your way to unlocking something new, and thanks to a second playable character, you're bound to have a lot of fun despite a regular play-through's brevity. 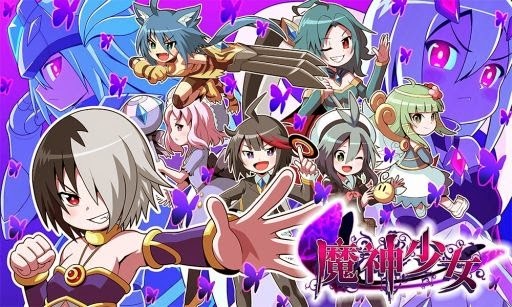 The Legend of Dark Witch may be cheap in price, but it doesn't look cheap presentation-wise. The 2D pixel art in the characters and particularly the backgrounds and landscapes look absolutely phenomenal. The lack of any stereoscopic 3D at all is a bit disappointing, considering how great it would make the already exquisite art pop out to the player. but the odds are on her side regardless. Regarding sound, the music is suitably Mega Man-ish, featuring different catchy themes for each stage. Sound effects are pleasant and satisfying enough as you mow down enemies, and the voice acting, albeit in Japanese, isn't grating thankfully. Perhaps my only issue with the presentation comes from the localization/translation of the game into English. Typos, spelling mistakes, and more along those lines are abundant, but even then, it's nothing that got in my way of enjoying the game. 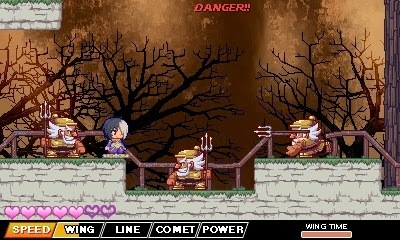 The Legend of Dark Witch is indeed a rather short game with some issues to it. However, there's plenty of longevity that would make the game worth purchasing even if it was more expensive than the very tempting $3.99 it sells for on the Nintendo eShop. It controls tightly, it looks splendid, and the challenge is just right. It's a bewitching trifecta worthy of looking into for anyone yearning for a non-Mega Man Mega Man game.